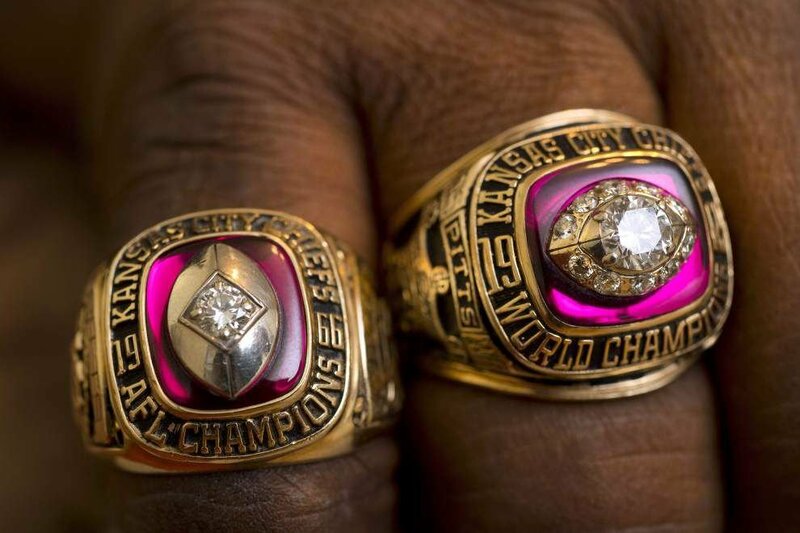 Advocate staff photo by TRAVIS SPRADLING -- His two Super Bowl Championship rings ('66, left, '69, right) say 'Kansas City Chiefs,' but Baton Rouge's Frank Pitts will be a Patriot on Super Bowl Sunday, since he is the grandfather of New England running back Brandon Bolden. Advocate staff photo by TRAVIS SPRADLING -- Baton Rouge's Frank Pitts, who played in the Super Bowl for the Kansas City Chiefs, is the grandfather of running back Brandon Bolden, who will play in the upcoming Super Bowl for the New England Patriots. PHOENIX — Brycen Bolden has sat in his great-grandfather’s living room more than once and been forced to watch old videos of the Super Bowl that features a much younger version the man identified by the announcers of Frank Pitts. Brycen Bolden is only 3 years old. There’s little indication he knows what he’s watching, but this is how things are done in Pitts’ family. He’s proud of his football heritage and that he played for the Kansas City Chiefs in Super Bowls I and IV. Besides, this is the same thing Pitts did with grandson, Brandon Bolden, and he’ll be suiting up for the New England Patriots in Sunday’s Super Bowl against the Seattle Seahawks. 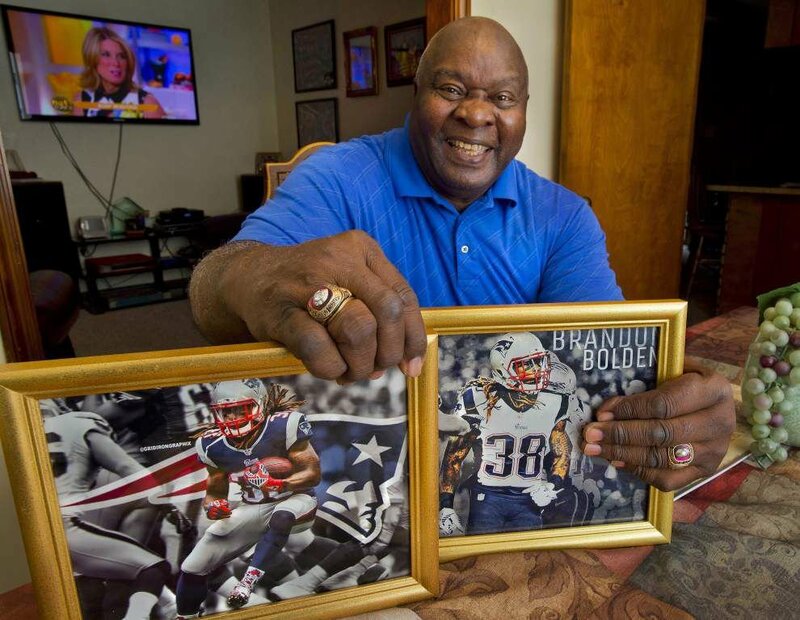 In many ways, Bolden’s football journey from Scotlandville High School in Baton Rouge, to Ole Miss, and now to the New England Patriots, where he plays at running back, can be traced to Pitts’ Baton Rouge living room. There, Pitts says, Bolden became fascinated with the memorabilia from his playing days, watched those same Super Bowl tapes, and ultimately fell in love with the game. Though he had an early fascination with football, Bolden did not play at a young age. He was too big to play youth football, failing to meet the weight requirements, and stuck with baseball until he was in high school. That’s when he started providing Pitts with the memories he still holds dear to his heart — like the time Pitts claims his grandson jumped clear over a defender to avoid being tackled. Bolden, who has 139 carries for 634 yards over his three-year career and stars on special teams, is not willing to take all the credit. Much of his success is because of the tutelage of his grandfather, who he says calls him after every game and goes over every single one of his plays from the opening kickoff to the last play of the game. These grading reports, as Bolden calls them, have been instrumental to his success. But there’s one point the two cannot see eye-to-eye on. And when it is brought up to Bolden, he immediately begins laughing. “When Brandon runs with the ball, Frank says, ‘Brandon, put that ball in your right hand and hold it tight to your body,” Diane Pitts, Frank’s wife, interjected during a recent interview at the couple’s home. “I tell him all the time I’m left-handed,” Bolden said. He can tell you all about the nerves he experienced before Super Bowl I, which his Chiefs lost 35-10 to the Green Bay Packers. Pitts, who caught 175 passes for an average of 16.6 yards per reception with 27 touchdowns during his 10-year career with Kansas City, Cleveland and Oakland, can also tell you all about his special teams plays during that game. His memories from the fourth Super Bowl are more pleasant. He ran three reverses for 37 yards with gains of 19, 11, and 7 yards and caught three passes for 33 yards. His favorite play during that game was a reverse, which set up a Jan Stenerud field goal. He was right. The plays helped the Chiefs earn a 23-7 victory over the Minnesota Vikings at Tulane Stadium in New Orleans. Some thieves tried to rob Pitts’ of his memories from that game when they broke into his home around 2005 and stole his Super Bowl ring as well as an AFL Championship ring from 1966. However, shortly after, a group of legislators presented Pitts, who was working as a sergeant at arms, with replacement rings at a Saints game. He now keeps the rings safe by keeping them on his fingers, which is where they will be this weekend when he’s scolding his grandson for carrying the ball in his right arm. “It’s heart-warming just realizing that my grandson is stepping in my shoes and going to the ‘Big Show,’ ” Frank Pitts said. Now Brycen Bolden is going to have third Super Bowl to watch. Who knows, maybe someday he’ll have his own video to add to the collection. Playing in Super Bowls seems to be the family business.